What: Italian-inspired Mini Turkey Casserole that is easy to assemble and prep ahead. Side-note: This tried and true kids’ favorite was one of the first recipes of its kind that I featured on my Instagram. I received such great feedback that I was inspired to start documenting my kids meals for all to see on Neurotic-mom.com! 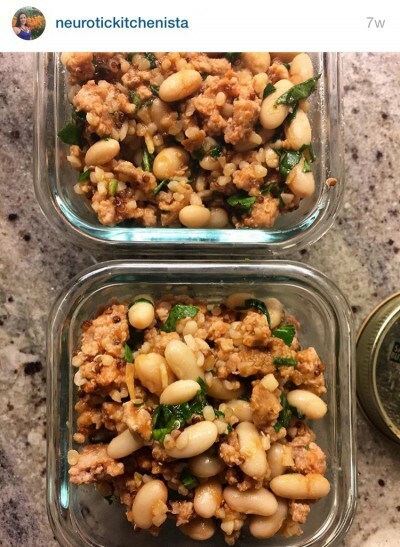 How: Fast-cooking grains or pastas (we chose Quinoa for this but we also love it with Orzo or Farro) made ahead in large batches allow you to create easy kids meals in a snap. You can make personalized mini casseroles in small glass pyrex dishes or make larger batches (for several kids) that can be warmed in the oven and served. In a medium skillet, warm the cooked Ground Turkey with the Quinoa. Add the Butter and stir until just melted. Stir in the Beans and mix. Stir in the minced Garlic and allow flavors to blend, another 2 minutes. Stir in the Strained Tomatoes and stir. Now add the minced Basil.